A Deliciously easy recipe to make in a rush, It’s perfect for a one person meal or a snack for kids to enjoy. The flavors from Peanut butter, Sesame oil and chilli comes together in a perfect combination to satisfy anyone. I had a Smeogal moment with a certain object before writing this recipe post. In case you’re wondering who the Papaya (why not?) Smoegal is, he’s the creature you meet in Lord of the ring whose obsessed with the ring. To keep you guessing and avoid confusion, I’m going to be calling this object “it”or “thing”for the next few lines. Picture me repeating “my precious”because for some reason that’s how I feel every time the need for this thing arises. Besides, I’ll be using it for a couple of years with my youngest, so the Smeogel-me, is here to stay for a very.long.time…. (maybe another two years give or take). For the past Fifteen years this “thing”has kept me sane. It’s small, It’s soft, there’s one, always in my bag and I’ll say it again, It’s been the only reason I continue to have a good night’s sleep which in turn keeps me from flipping out due to sleep deprivation. Its contained major disasters, I mean loads of it within. I almost never panic when kids have accidents or fall sick but not having this object will absolutely put me in a panic scale of hundred, I’ll be pulling my hair, walking about muttering like a mama beast and If there is a mean side to me, you’ll see it then because I LOVE MY SLEEP! I can’t count the times I’ve sent funny guy to buy these stuff in the middle of the night, he and I have a very public joke that goes along the line,”if we had saved all the money spent on this object, we would have been millionaires by now and he wouldn’t threaten to pawn something(I won’t tell what) to buy these and believe me it sound way better when he says it. O.k, I hope you mama’s out there agree with me when I give the answer because there is no way, no possible way I’m the only one who reacts like a mad hatter when I don’t have these around. It’s the diaper, pamper, nappy whatever you call it in your country. I can’t imagine how I would have got through four kids without them. From Durrah to Raaya I’ve probably used a million and shudder to think of the negative impact I’ve caused the environment. Bother! !, I just had to go and google, found out what diapers are doing to the environment and it’s not good,”each year enough disposable diapers are thrown away to fill thirty empire state buildings”. Me thinks, Raaya needs to be potty trained faster than I thought. Moving on to the recipe, for the record if my son Nadeem should come across this recipe, all credits go to him(it’s a long story). I think the time is just right with the hype on a certain type of pre-packed noodles on the news being banned due to health issues, this recipe is going to be your next substitute. I love making this noodle dish. 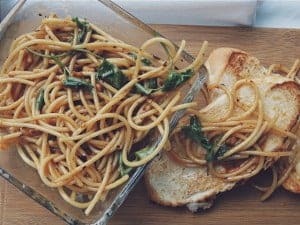 If you are lazy to go through all that cooking this is what you can make and as simple as it is, this recipe is quite adaptable if you should want to add any other ingredient to it. It even tastes better cold. 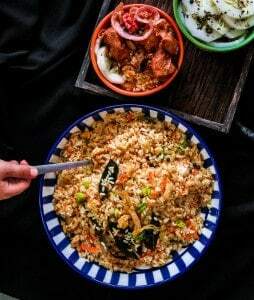 And if you are love easy recipes, this Asian style chicken fried rice might interest you. Allergy warning this recipe uses Peanut Butter and if any of your kids should have nut allergies, this recipe is not for you. Cook the Spaghetti as per instructions on the box, drain and set aside. I usually undercook by a few minutes so it’s not very soft. 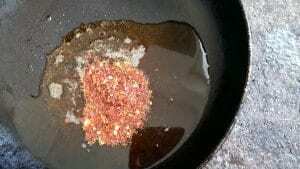 In a pan, add Sesame oil, Vegetable oil and Chilli flecks. Turn on the heat to low and let the oil absorb the heat of the chilli, cook for a few minutes, let it cool and strain the chilli from the oil. you can skip this part if you’re feeding kids who are not fans of chilli. 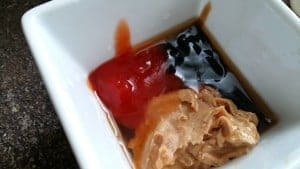 In a bowl mix, in the Soy sauce, Honey, Peanut butter, Tomato sauce. Once you’ve mixed everything together, add the oil as you can see I chose to leave the Chilli flecks in and add salt to taste. 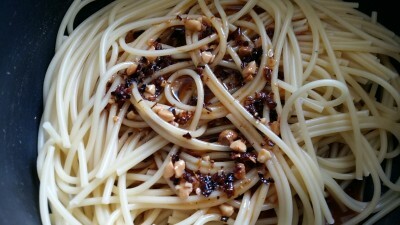 Add the sauce into the Spaghetti and mix well, making sure they are well coated if you find the sauce is not enough and dry just add another tablespoon of Peanut butter, Sauce and honey. 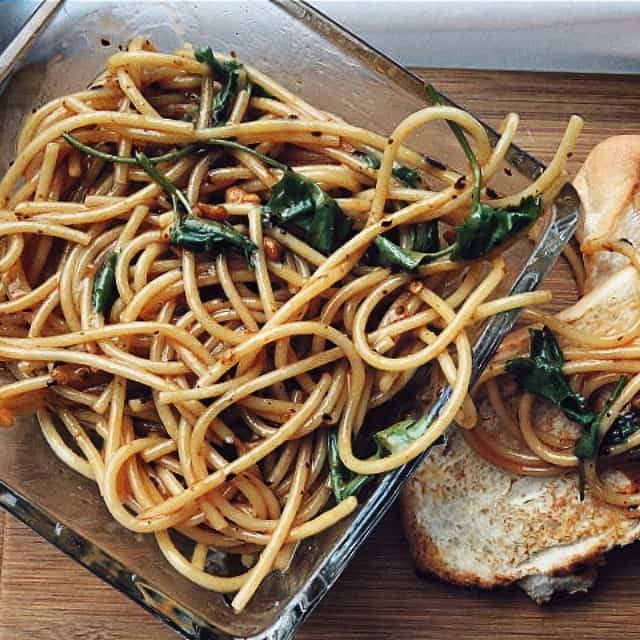 Mix in a few cilantro and your Spicy or not Peanut sesame noodles, is ready. 30-minute family meal, a quick spin on your favorite take out. It’s a one pot dish for busy week nights and lazy Sunday lunch. I think I’ve created a bunch of hungry monsters and for the most part it’s a good thing. Not that I’m complaining but a desperate observation, it’s hard to keep up with two but try keeping up with four and you’ll feel like you’re in an endless kitchen marathon. No longer are they happy with casual breakfast or a sandwich for busy mornings not even the daily Sri Lankan lunch menu seem to satisfy them. What they want from me is to take them on food adventures that tingle their taste buds. My dysfunctional kitchen is where they get to experience different cuisines of the world. You can too, just stick around with me, along with Sri Lankan recipes, I’ll be diving into food from around the world as well. Today, I’m dabbing into far east cuisine with this spicy 30 minute take out style noodle. I realised something while making this dish. All those pricey restaurants, in this instant, the chinese ones closer to my home, do over price their meals, we spend three times more than what I created with this spicy noodles and it just took me 30 minute to get it on the table. Just make sure to buy yourself the three main ingredients, Hoisin sauce, Fish sauce and Rice vinegar used here and you can easily recreate this dish whenever you want. One more plus point is that I get to expand my kitchen pantry as well as learn how they change taste and texture. Confession, yes, there are days when my kitchen is closed, being a food blogger does not mean I cook daily there are days I put my feet up and let the meals be delivered to my home. Other family meals to try- Asian style chicken and vegetable fried rice in a hurry. Before moving onto the recipe, Let’s start a conversation about the pans we love to cook our meals in, most of you must own medium-sized skillet to do your stir-frying but if you don’t own a large wok, I would really recommend. having one for an emergency, even if you are a family of two. Mine is actually not a chef’s wok but one picked up from Ikea and I can’t tell you how many times I use it to make large portions of meals like stews, soups, stir-fried rice and noodles like this. they are so easy to maintain and clean. of course with a lot of hands around the house, I have strict instructions on how, not to use metal spoons to avoid scrapes on the protective coating. So go ahead and buy a large wok, I promise you won’t regret it. 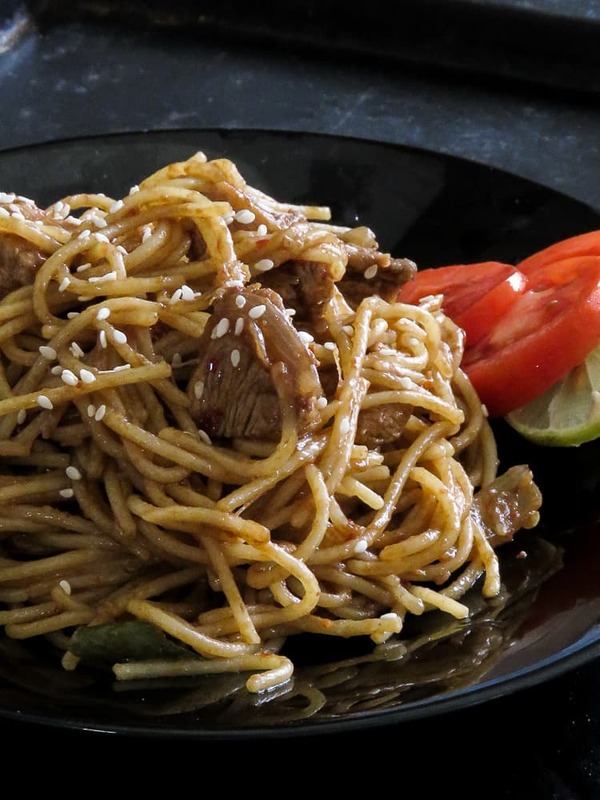 Recipe-30 minute take-out style spicy Asian noodle. 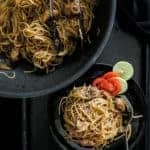 This 30 minute Asian inspired noodle is ideal as a family meal or even to feed a large crowd in a rush, my kids love to eat at all times of the day so making a large pan of this never goes in waste. Please make sure to read the recipe instructions carefully. 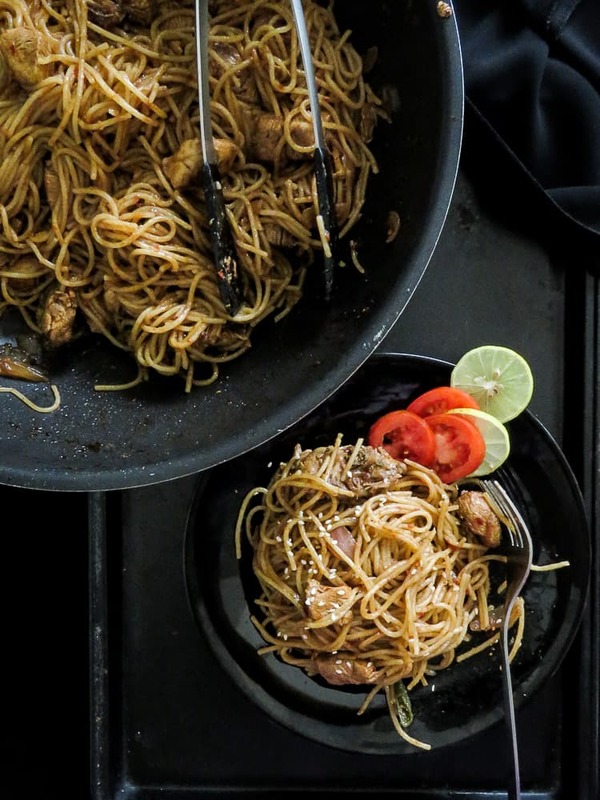 A few things to keep in mind..
1/ When making a big batch of this Spicy Asian Noodles, there’s a chance you might have to adjust certain ingredients to your liking or you might find it bland or not seasoned enough so make sure to taste and adjust accordingly. 2/ while cooking the Noodles, follow the instructions on the package, if the cooking time is mentioned, for example as 10-12 minutes, stop cooking the Noodle by 8-9 minutes to avoid the noodles being overcooked. 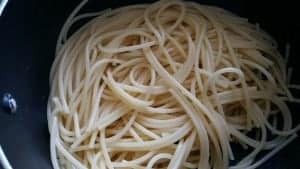 3/There are times you might not have rice Noodles at hand, if so you can replace it with thin spaghetti. Place a skillet/ wok over medium heat. Pour in 2 tablespoons of Sesam oil and gently saute the minced Ginger and garlic for 30-45 seconds until they turn golden. stir constantly to avoid them being burnt. once cooked transfer into a bowl. 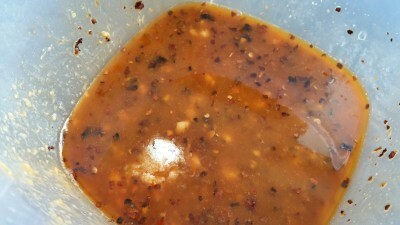 Pour in the remaining tablespoon of oil, stir-fry the chicken, Onion, Soy sauce, rice vinegar, hoisin sauce over medium heat. Cook the above ingredients for 3-4 minutes or until the chicken are done. As per instructions of the package, cook the noodles, once its cooked, drain, rinse under cold water. 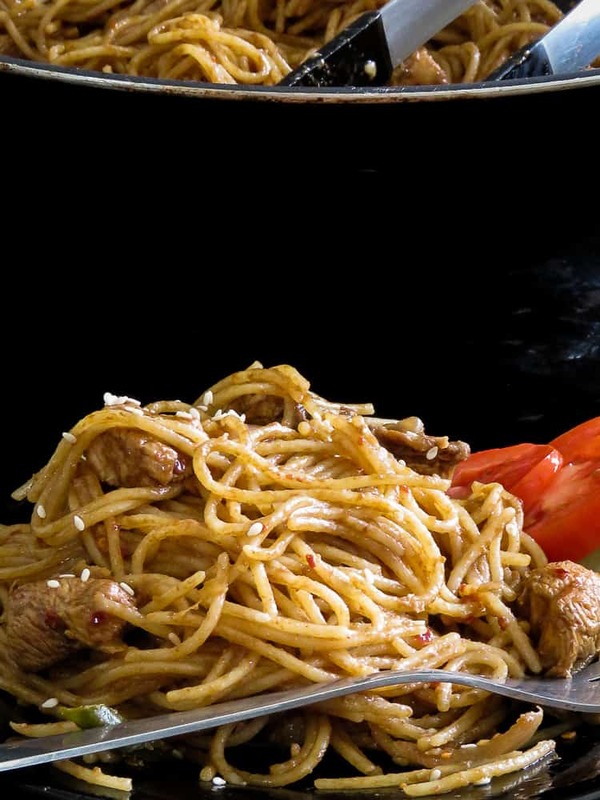 Toss the Noodles thoroughly with ingredients in the skillet, for 1-2 minute. Season with Salt if necessary. 30-minute family meal, a quick spin on your favorite take out. It’s a one pot meal for busy week nights and lazy Sunday lunch. Mix in the Ginger, garlic with all the other ingredients in the skillet. For more recipes like this 30 minute-take out style spicy Asian noodle. Suubscribe to the blog by adding your email address in the subscribe box and you will get all the recipes I publish straight into your email. You can also find me on Facebook, Twitter, Instagram and Pinterest.